It’s really simple. With the sonic and technological heritage from our top range, this integrated amplifier is bound to take your breath away. The design, the price tag and the reviews of this thing are all nice and friendly, but the performance is awesome with a true-to-concert power potential and a frightening grip on all aspects of the musical experience. Two balanced and four unbalanced input and a home theater inputs option, that enables the Di150 to be used with a surround processor. It will put an end to compromise and deliver the same renowned high end quality sound in your front speakers, as you have when listening in stereo. Mos Fet output stage built around industrial transistors capable of more than 400 amps! 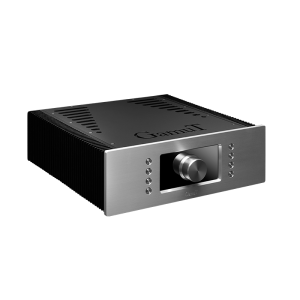 The power supply of this discreetly looking amplifier is made with fast delivery and high bandwidth in mind. With approx. 1000Watts of transformers and four beer can sized capacitors with a total of 64.000uF in capacity, this direct wire-connected supply is the oversized heart of the beast. As if having one of the world’s absolute best integrated amplifiers wasn’t good enough – we made it better! Instead of writing the complete list of small and bigger improvements, we sent you directly to the words of reviewer Ron Nagle of “Enjoy The Music” article of our little wonder!